With WordPress you have two options when it comes to getting your blog up and running. You can either host it at WordPress or you can download it and set it up on your server. Click on "Plugins" then click "Add New". Use the search box to find the plugin. Once you find the plugin, click on "Install Now". Before we move on, make sure that Akismet plugin in activated (Akismet plugin typically comes pre-installed part of standard Wordpress installation). Once plugin is installed, it will show up in the list of installed plugins. Now we need to activate them. Select the "Akismet" & "Jetpack" plugins. From the dropdown, select the Activate option and click on "Activate". Now that plugin is active, let's connect it to WordPress.com. Click on "Connect to WordPress.com" button. You will be taken to create an account or login. If you don't have an account, you can create it. To get your API key, head over to "Akismet" and click Connect with "Jetpack"
The API key should be visible at the bottom of the page. That's it. The rest of the process is simple. Simply click on "Connect Profile" in Social Report, and click on theWordpress icon. 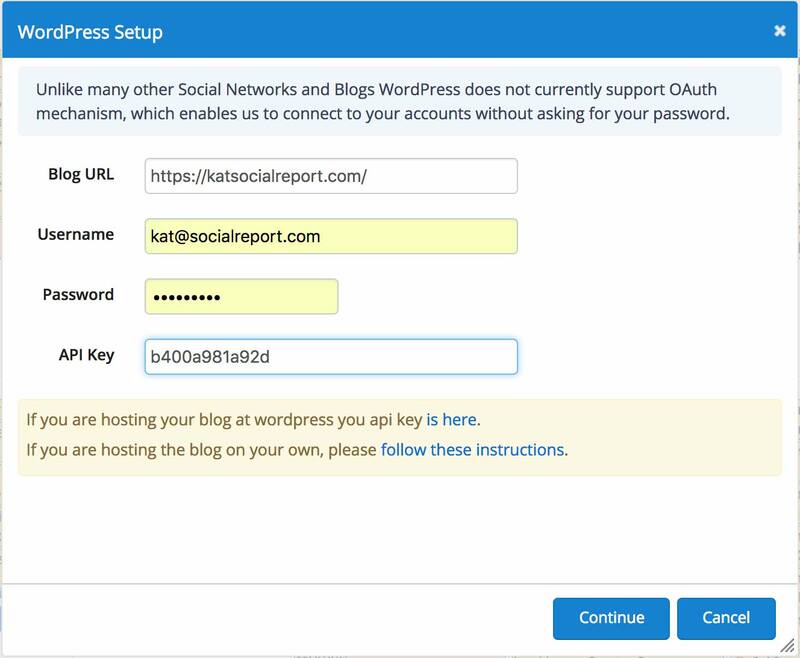 Use your Wordpress administrative user credentials & the API key from Akismet to connect it.